The Fairfax Asterisk is a recently-coined name for the busy intersection where Fairfax Avenue, Olympic Boulevard, and San Vicente Boulevard come together. It is one of the rare spots where L.A. has a six-way intersection with three major thoroughfares. It is also about a half-mile south of the under-construction Metro Purple Line subway station at Wilshire/Fairfax, expected to open in 2023. 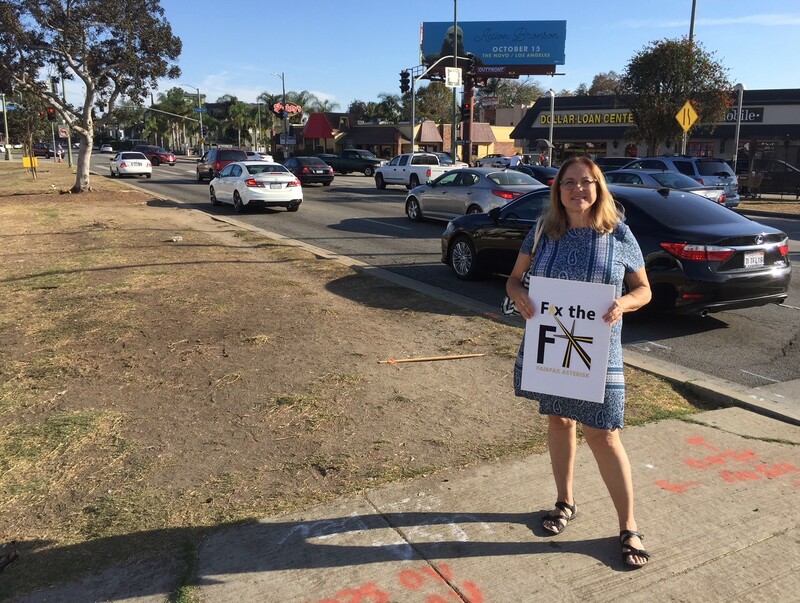 Fix the Fairfax Asterisk spokesperson Michelle Menna standing on the San Vicente Boulevard median island. Photo by Joe Linton/Streetsblog L.A.
SBLA met with Fix the Fairfax Asterisk spokesperson Michelle Menna, who lamented the dangers faced by her daughters when walking across the asterisk to get to school. “Between seven and nine and between three and seven… it’s absolutely crazy” Menna explained. She lamented that it takes multiple signal phases for pedestrians and drivers to get through the oversize intersection, with pedestrians stuck on median islands with garbage and homeless encampments. Further, per Menna, pedestrians, including her daughters, step off the islands and then have to weave through gridlocked cars stopped blocking crosswalks, or have to dodge moving cars to get across. Menna is thinking of equipping her high school student daughter with a GoPro camera to document problems encountered walking to school. The triangle at the center of the Fairfax asterisk. Photo by Joe Linton/Streetsblog L.A.
Menna said that Fix the Fairfax Asterisk is looking into both short- and long-term fixes to make the asterisk area safer and more walkable. Per Menna, short term solutions could include things like crossing guards, in-street pedestrian signage (similar to West Hollywood), or pedestrian head-start intervals. Menna sees more expensive longer term solutions potentially involving grade separation – a bridge or a tunnel to separate cars from pedestrians. At this point, though, the group is trying to work with the city to do a study that would work with the community to propose and evaluate potential walkability improvements. Working with the city has not been easy, as the asterisk straddles three different Los Angeles City Council districts. The area east of Fairfax is Council District 5, represented by Paul Koretz. The area west of Fairfax is split along San Vicente, with the north in David Ryu’s CD4, and the south in Herb Wesson’s CD10. Fix the Fairfax Asterisk currently includes neighbors from Carthay Square, Carthay Circle, and Wilshire Vista – including Little Ethiopia. Readers interested in getting involved in efforts to Fix the Fairfax Asterisk can contact the group via their Facebook page. Ticket drivers who break the law. What a novel concept. Why not just close San Vicente for a couple of blocks in each direction? Build a park over it. I thought you were going to suggest crucifying the drivers. I suppose ticketing might work. I ride a bicycle to work at Wilshire and Fairfax and regularly have to cross this intersection. It is absolutly terrifying for me every single time and seriously needs to be fixed, but I wonder what the solution could be… would a European-style roundabout work here? this intersection was a b**ch 50 years ago. I understand her frustration but pedestrian tunnels are a mostly a failed experiment in Los Angeles (I guess they forgot that you have to staff and maintain them). Anyone know of any tunnels still regularly in service? I know of a handful below a few freeways but that’s about it. If there’s space for a little convenience store in a tunnel, that might be able to provide staff and maintenance through the presence of a business. Of course, that’ll only work if foot traffic in the area is enough to sustain a small business, whether a convenience store or a food stand or whatever. Chicago has many of these 6 corner intersections. The fix for one was to re- route the equivalent to San Vicente. First construct SV into a N-S street (about 1/2 mile from and parallel to Fairfax; then construct SV into a E-W street until it meets existing SV at a diagonal. This is Elston/Damen/Fullerton in Chicago, Elston was rerouted in a less residential and more industrial area where old factories were acquired. Since the LA neighborhood looks packed with houses, you may just have to build a new overpass to carry SV above Fairfax and Olympic. 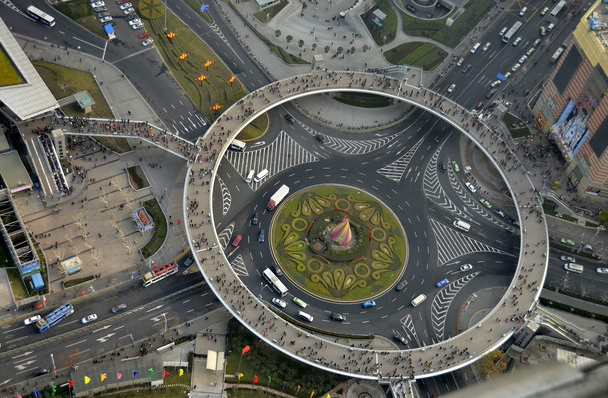 this is the perfect place for a major “euro-style” roundabout… the pedestrians will just walk around the periphery. Your last sentence is exactly one of my ideas. Unfortunately, the council district reps are waiting for recommendations from the assigned experts -LADOT- the L.A. Dept. of Transportation. The best solution is to keep people off those islands. 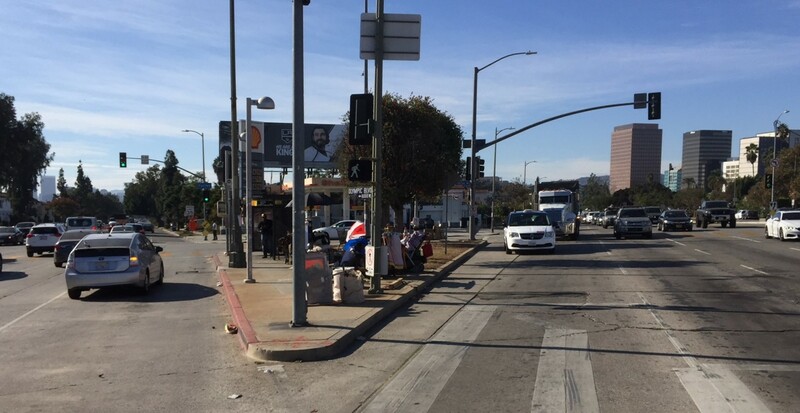 Move the bus stop a block west and eliminate all crosswalks that lead to the islands on Fairfax northbound. People should only cross on the outside of the triangle, or cross on the southbound Fairfax side. Pedestrian tunnels don’t work because bad things happen in them. And the homeless would take them over. I’ve been driving through this intersection for years. It’s a nightmare. It always takes several light cycles to get through. Traffic circle is the way to go as long as one of the streets doesn’t back up into the circle. More expensive would be to have a flyover but well worth the investment. As someone says below, you can activate the space below the flyowever by allowing small shops to occupy the space. This discourages homeless from using it as a shelter and increases the pedestrian friendliness of the space. I think flyovers at several of the most congested intersections in the city. would help the city move much more efficiently. Very smart design. I don’t think the pedestrian traffic in the “Fairfax Astericks” would justify the expense though. Perhaps if a change in density was allowed in nearly commercial corridors. In the photograph they have a lot of wasted space with stripped painted areas. An improvement on this design would be to make the green space larger, and allow for a way for the pedestrians to access it over the traffic. Wouldn’t prohibiting LEFT TURNS at the intersection resolve this issue? They need to immediately implement road diets on all three streets. Once everyone starts riding their bikes it will be safer for pedestrians. West Hollywood improved Sunset Blvd walkability by adding curb extensions, a parklet, public art, wayfinding, and sidewalk seating. Just How Great Will Those Great Streets Initiative Sites Become? Mayor Garcetti announced seven new Great Streets grants winners, plus LADOT recently announced nine Vision Zero grants.